Once upon a time, search engines were about providing links to pages. Notice what you get right up there at the top of the page. It’s an answer to your question. And then there’s that bit over to the right—the part that tells you all about K-Mart. A good 2/3 of the content you see above the fold isn’t links to pages. It’s Google providing you the information you’re looking for, right there in the search results. No second click required. 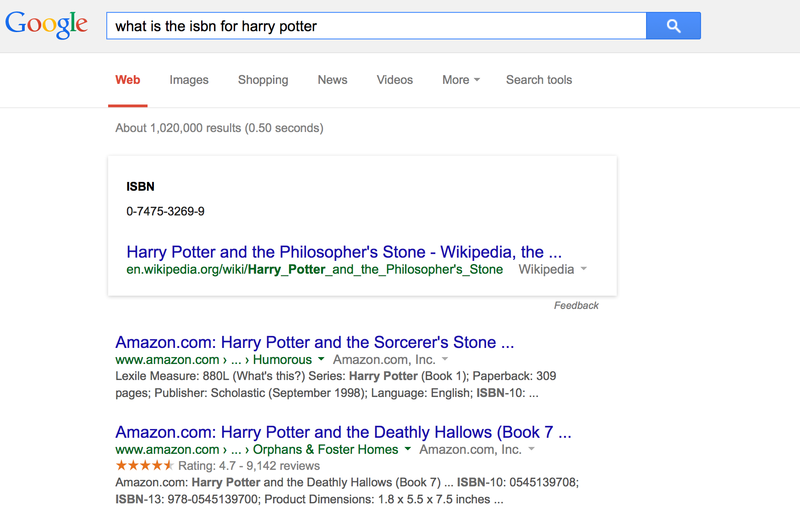 So what kind of black magic lets Google do this? Searle thinks the Turing Test doesn’t work, and the Chinese Room Argument is his thought experiment to show why. Every once in a while, a sheet of paper comes through the mail slot with some markings on it. You then use your instructions to look up the markings that came through the slot, go find a different set of markings in your books, copy those markings onto a new sheet of paper, and then push the results back through the mail slot. As you’ve probably already deduced by now, the markings are actually Chinese writing, and the things coming in through the mail slot are questions in Chinese. The markings you’re looking up and spitting back out are perfectly coherent answers to those questions. To anyone outside the room, you’d pass the Turing Test for speaking Chinese. But you don’t understand a word of Chinese. Searle concludes that the ability to manipulate language based purely on the shapes of symbols (or syntax) is not sufficient for actual understanding (or semantics). Or, more briefly, syntax is not semantics. Sadly, Google’s robots are terrible at semantics. All the stuff that’s inside your markup (aka, the things between the tags; aka, your content)…they’re just a bunch of shapes. The rules tell the robots what to do with those shapes. But the robots can no more read those shapes than you can read the symbols in the Chinese room. Fortunately, there’s a way to cheat. The robots don’t understand the semantics of what shows up inside your markup. But they do recognize semantic meaning if you put that meaning inside your markup. You can’t make the robots understand semantics. But you can help Google write a much better rulebook for its robots to follow. If [set of markings], then go to shelf 4, book 12, page 174 and copy paragraph 4. If polite greeting: [set of markings], then go to the conversational openers shelf, select the small talk book, and copy polite greeting response: [set of markings]. These changes don’t make Google’s robots any smarter. But they do make your content a little smarter. And, even more importantly, it lets the really smart engineers at Google write a much, much better rulebook for the robots. Fortunately, a lot of the work we’ll need to do to add semantic meaning to our markup has already been done for us. Google, Microsoft, Yahoo, and others sponsor a project called Schema.org, which houses a standardized set of semantic markup. All the tags you’ll find there are already incorporated into the rulebook that Google’s robots use. And if your content doesn’t quite fit into any of the existing models…well, you’re still in luck. Schema.org is opensource. You can add your very own set of terms, and those will go into the rulebook as well. Mark up your content this way, and when someone asks Google’s robots about the ISBN for your latest book, the robots will return an answer and not just a list of pages. People aren’t searching for links. They’re searching for answers to questions. Sadly, implementing semantic markup isn’t an overnight fix. It’s going to require some help from your IT team. And it’s also going to require structured content. After all, if your book content type has a separate field for the ISBN, it’s pretty easy to write some code that will apply right semantic tag automatically. We wonks have really good, high-quality answers to all sorts of questions that ordinary people ask every day. But many of those ordinary people will never see our websites because Google’s robots are pulling lower-quality answers from Wikipedia. The robots would be equally happy to pull those answers from us instead. We just have to make our content smart enough for them to find it. ‹ So you want to be a mentor? s tidak mungkin bagi perusahaan untuk mengabaikan godaan internet . Dengan gabungan dari PHP dan LAMP klien mendapatkan kegiatan bisnis online mereka .